Stunning progress in solar technology has positioned humankind to make the quantum leap from fossil fuels to clean energy in the coming decade, just as the advent of the automobile enabled the radical transition from the horse and buggy to cars a century ago. The 75% decline in cost of solar electric panels over the past 10 years has turned solar into a practical investment that is accelerating New England’s transition to clean energy. Whether purchased upfront or financed, whether you own your home or rent, whether it’s installed on the roof, on the ground, or across the state, solar technology can help your household, business, or institution save money and the environment. Below is a guide to the multiple solar options available today. The great news is that there is viable a way to go solar for everyone! Rooftop solar: our bread and butter, and a product we continue to get better and more efficient at installing even after 10+ years and 6,000+ installations! Rooftop solar installations are our most common installation and the form of solar people are most familiar with. But even so, there have been some advancements in the way we approach rooftop solar as equipment prices decline and electrical/fire codes become more rigorous. What is the roof’s orientation? Any roof facing between southeast and southwest makes a great solar roof. If you want to get scientific, use a compass or compass smartphone app to see which direction your roof faces. The perfect solar orientation is 195 degrees (15 degrees west of due magnetic south on a compass, also known as ‘true south’) but any orientation between 150 and 240 degrees is within 10% of perfect. With that said, as equipment costs have dropped, our tolerance for off-axis systems has increased somewhat. For example, a solar array that is positioned due west may (depending on the roof slope) harvest within 20% of its ideal annual production. Since much of a solar project’s total project cost is fixed overhead (electrical connections, inverter, permitting, getting a crew on-site, etc.) it may be possible to simply add extra solar panels to make up for the production loss on a strongly east or west facing roof and still see a very strong ROI for your solar project. The actual solar panels have become ‘cheap’ – relatively speaking – so there is a certain cost curve where adding additional solar panels does not significantly impact the fixed costs of the project but allows you to generate more power (and, accordingly, more savings) for a modest increase to project budget. What is the slope of the roof? Most common roof pitches, e.g. 4/12 to 12/12 are just fine for solar, and do not significantly impact the overall yearly solar harvest. More extreme angles (mounting on a flat roof or an awning mount) require special hardware, but are also good options in many cases. Is the roof impacting by shade trees or other obstructions? Maine and New Hampshire are heavily forested states and we sure do love our lovely oaks and pines! However, such trees can pose major problems with solar production. On any solar site, we are looking for an open solar window from 9am – 3pm, year round. Any significant shading during the ‘peak’ hours of the day will affect solar production and reduce the system’s ROI. That said, because ReVision Energy employs module level optimizers on most of our residential projects, solar systems are more tolerant of partial shading than ever before. We use the industry’s best site survey tools when conducting solar evaluations so we can generate an accurate analysis of potential shade issues and advise potential customers accordingly. What is the roof material and what is its condition? 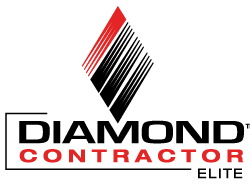 We routinely install on asphalt roofs, rubber roofs, and metal roofs of all types. Slate, copper, and shake roofs are somewhat more challenging, and in some cases the additional cost will mean that a ground mounted solar array is a better option. As far as a roof’s longevity – we advise homeowners who expect to replace their roof within 10 years, to do so before installing solar (and you can replace just the part of the roof the solar will cover, if needed). If you have 10+ years left, it’s probably worth waiting. Pulling down solar panels so a roofer can re-roof is fairly routine and, while a bit inconvenient, not a major impact on the solar array’s lifetime ROI. Our general advice is to not worry too much about snow and let Mother Nature do her thing. After a winter storm, the sun will come out (it always does!) and as the snow on top of the panels warms, the snow will shed, and the panels’ production will be restored. If it is too cold/gloomy for snow to shed, then there is not a huge amount of solar to be harvested anyways. We cover all these questions – and more! – during our free solar evaluation. If we determine a rooftop is not the ideal location for a solar array, then there are plenty of other options (Read on!). 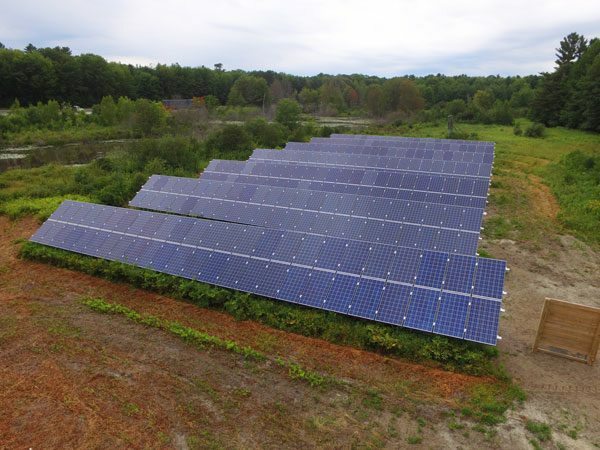 Now that we have our own pile-driving and ground screw equipment, we can offer our most competitive prices ever for ground-mounted solar electric arrays, like this one in East Kingston, New Hampshire. For all those situations where a roof-mounted system is not viable (or not wanted) another option is to install solar panels on the ground. 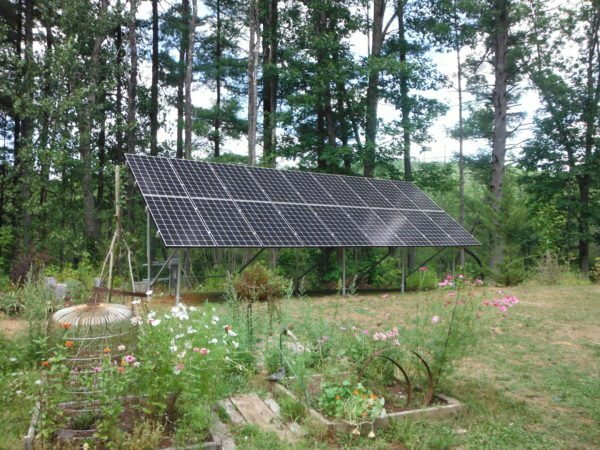 Due to the need to survive decades of punishment from harsh winters, ground-mounted solar arrays must be built particularly tough in the Northeast. The footings and wire management system must be able to handle hundreds of freeze/thaws, and the panels must be able to withstand uplift from wind, multiple feet of snow, and pummeling from rain and hail. Historically that has meant that ground mounted systems in the northeast involve heavy excavation to pour large concrete footers to support the solar array. The concrete work is not only CO2 intensive and disruptive to the site, but costly. As a result, ground-mounted solutions have historically commanded a significant premium over roof-mounted projects of a similar size. Our engineering team, not to be deterred by the challenge of marrying absolutely perfect product performance with a need to reduce costs and gain efficiency, has evaluated hundreds of racking and foundation solutions over the years. This year, we made an investment that significantly improves our ability to install ground-mounted arrays: a Pauselli 900 solar pile driver, which allows us to installed pile-driven posts or ground screws for solar arrays without the need for any concrete. What used to take hours can now be done in a matter of minutes, and with far less disruption to the site! With the new equipment in play, our premium for installing a ground-mounted solar array has dropped by over 30%, to the point where in some instances the ground mount solution will be comparable or cost-competitive with roof mounted installations. We also are still fans of and installers of AllSun Solar Trackers, a dual-axis, GPS-driven tracking system that allows a solar array to harvest roughly 40% more electricity in a given location than a traditional, fixed-axis system. Aerial view of the Maine Idyll Court Community Solar Farm in Freeport, Maine. This “CSF” provides electricity for 9 homeowners, with the same billing arrangement as if the solar was installed at their own home. Don’t own your home? Don’t have any land viable for solar? Think you might be moving soon? There is still a solar option for you: a community solar farm (CSF) share. ReVision Energy’s approach to CSFs is a member-ownership model that follows the concept of community supported agriculture (CSAs). Rather than building the solar array on site at their own home (growing a garden), a CSF shareholder invests in a solar project somewhere offsite (at the solar ‘Farm’). 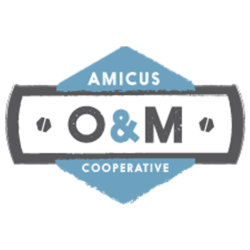 A certain minimum number of people are needed to make the farm possible (in Maine, there is a current arbitrary cap of 10 participants), and when the project is built, each shareholder gets the benefit of an amount of solar production relative to their % ownership in the Farm. Billing-wise, a CSF share works identically to having solar production at your home. 100% of the solar electricity generated by the solar farm is sent back to the grid. Each shareholder gets a credit (based on their % share) automatically applied on their utility account, which can accumulate for up to a year and be used for any electric load, whether that be heating water, heating the home, or powering an electric car. The CSF share is utility-specific. Should you move within your region and stay with the same electric utility, your CSF share simply transfers with you. Should you need to move out of the region, your CSF share can be transferred to a new owner. ReVision Energy maintains a long waitlist of people eager to buy out existing CSF shares and can help set up the transaction. Finally, we should note that whatever path to a solar investment is right for you, we encourage you to own, rather than lease, your solar power. In markets where solar leasing is offered, it can look attractive at first blush. No money down? Save money right away? Sign me up! But, lost in the fine print is how bad a deal solar leasing is, long-term. A solar array that you own can act like a valuable long-term investment, protecting your home/business from electric price hikes, while simultaneously reducing the need for dirty electricity. We use very careful (and conservative) financial modeling so that the solar arrays we design for customers live up to their expectations in terms of # of kilowatt-hours generated, and accordingly, the value of that solar project to the customer each year. A solar array will reliably produce a fixed amount of power, for decades, for no additional cost once it’s installed. Meanwhile, the grid electricity it offsets is projected to increase 3% annually, forever. Meaning, if you own your power, you will recoup the investment you made in the solar project (either by paying for it upfront or financing it) and then have the remainder of its useful life (40+ years) as free power. With a solar lease, you might save a few pennies per kilowatt-hour vs. the utility in the short term, but long term, you will never achieve the freedom and financial advantages of having control over your energy future. A solar lease can also make it harder to sell your house. For those who don’t have the upfront capital to make a solar cash purchase, we have been offering “Own Your Power” Solar Loans for over 2 years now, which function much like a solar lease, but with all the advantages of ownership. You can switch from a monthly utility payment, to a monthly solar payment, and after 12 years you will pay off the solar loan and start benefiting from free power (vs. the lease, which would continue through 20 years).